Sumerian inscription on a ceramic stone plaque. Sumerian literature is the earliest known literature and it was written in the Sumerian language during the Middle Bronze Age. 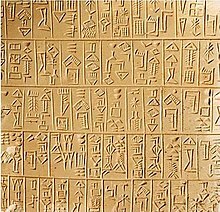 The Sumerians invented one of the first writing systems, developing Sumerian cuneiform writing out of earlier proto-writing systems by about the 30th century BC. The Sumerian language remained in official and literary use in the Akkadian and Babylonian empires, even after the spoken language disappeared from the population; literacy was widespread, and the Sumerian texts that students copied heavily influenced later Babylonian literature. Most Sumerian literature is written in left-justified lines, and could contain line-based organization such as the couplet or the stanza, but the Sumerian definition of poetry is unknown. It is not rhymed, although “comparable effects were sometimes exploited.” It did not use syllabo-tonic versification, and the writing system precludes detection of rhythm, metre, rhyme, or alliteration. Quantitative analysis of other possible poetic features seems to be lacking. Samuel Noah Kramer (1963). The Sumerians: Their History, Culture, and Character. University of Chicago Press. ISBN 978-0226452388. Thorkild Jacobsen (1987). The Harps that Once...: Sumerian Poetry in Translation. Yale University Press. ISBN 978-0300072785. JSTOR j.ctt32bjgs. Piotr Michalowski (1996). "Ancient Poetics". In M. E. Vogelzang; H. L. J. Vanstiphout. Mesopotamian Poetic Language: Sumerian and Akkadian. Styx. Jeremy Black (1998). Reading Sumerian Poetry. Cornell University Press. ISBN 978-0801435980. Jeremy Black; Graham Cunningham; Eleanor Robson; Gábor Zólyomi (2006). The Literature of Ancient Sumer. Oxford University Press. ISBN 9780199296330.